All drivers must arrive a minimum of 2 (two) hours before the posted race time, unless previous arrangements have been made. If not registered by said time, driver may not race. All members must show membership card at all venues. Failure to do so may result in having to pay to enter venue. One membership card allows driver and 1pit crew entrance to venue. All drivers must register before unloading their tractors. Any tractor in need of a re-tech. inspection has until one hour before the posted race time to do so. Any tractor either being speed or R.P.M. tested must be with the driver seated on the tractor and a SOLTRA official present. Dyno is only used for super stock. quarantine area to have their tractors re-tech'd immediately following their respective feature races. Failure to do so will result in disqualification. Tractors will be left running until they are tech'd (engine must be kept hot). (This is at the Executives’ discretion.). Machines are not allowed to dyno between heat races and the Feature unless in the presence of the Technical Director and only due to a machine breakdown during the heat. Each member will be responsible for his or her guests. Each volunteer (on the track) must sign a waiver. There will be a "ZERO TOLERANCE" to alcohol or drug consumption before or during a race. This includes all members and their guests. Anyone (members or guests) found consuming, or suspected of consuming alcohol or drugs before or during a race, will be removed from the pit area and will have their membership revoked without refund and will be banned from racing for a period of one year from the date of said offence. Registration will end one hour before posted race time. Drivers meeting will be called immediately following the closing of registration. All drivers and track workers will attend drivers meeting. Any driver that does not attend the drivers meeting for any reason, will be put to the last place starting position of his/her heat, Exceptions may be allowed at the discretion of the Executive. If time allows, there may be hot laps after the drivers meeting. No driver will be allowed on any track without prior permission from an Executive Member. In the event of a "difference of opinion" occurring on or off the track, members must not confront other members. Any "difference of opinion" must be brought to the attention of the Executive, only after all racing is completed. At which time the Executive Members will work together to reconcile the "difference of opinion". In the event of a driver experiencing problems with his/her tractor, or sees a problem with the track or another tractor, that driver must raise his/her hand so that a caution can be called. If one or more officials, or driver(s) feel that the track conditions have become unsafe, there will be a conference between officials and drivers and a decision will be made whether or not to resume racing. All decisions made by the Executive will be final! The following rules are subject to change without prior notice. Tractors must use all factory-manufactured parts (i.e. hood, grille, and chassis). With the exception of rear fenders, these may be fabricated, but are at the discretion of the tech committee. Every driver must have and wear a DOT approved racing helmet, (i.e. snowmobile or motorcycle) with goggles or face shield. Half helmets are not permitted (must cover ears). Full-faced helmets with neck collar are recommended. Proof of age required at membership sign up. All drivers must wear long pants, shirts, and closed toe, leather, over ankle shoes or boots. NO shorts, tank tops/sleeveless shirts, or sandals will be allowed. All tractors must run on pump fuel only (not to exceed 96 octane). No alcohol or other additives will be allowed. a) All tractors MUST and WILL go through a tech. inspection on at least one of two test and tune dates, and receive an inspection sticker before being allowed to race. If a failure occurs on either of these dates, drivers must make arrangements with their respective tech. directors to have their tractor re-tech’d. b) All shields and guards (including dash boards) must be in place as determined by the tech inspector. NO open debris screens on rear-engine tractors. There must be a device in place to keep fingers, hair etc. from coming into contact with debris screen. All gaps between seat and fenders must be filled. Any exhaust pipes exiting outside the tractor chassis must be covered with a suitable heat shield. NO seat, on ANY tractor, shall be mounted below the top of the chassis tunnel!! Any driver who fails to start in their heat race will be placed at the rear of the “B” feature. In the event there is not a “B” feature, drivers will be placed at the rear of the “A” main feature race. Only paid members will be eligible to draw for their starting positions and receive points and plaques to reflect their finishing positions. Limited membership holders will not be eligible for points, draw for position or receive free banquet tickets. All tractors must have a number (black number on white background, or white number on black background, a minimum of 3” high). Must be placed on both top, front corners of hood (may also have number on rear of tractor). Numbers must not exceed two (2) digits. Burnouts and unnecessary speed off track will not be tolerated. The first offense will result in the offending driver not being allowed to race for the remainder of that day, and a one full race day suspension which will be served at the next race offending driver attends. The 2nd offense will result in a suspension of two races and the 3rd offense will result in a suspension for remainder of season with a review of racing eligibility at end of suspension. Pit Stewards are authorized to administer disciplinary action, when necessary. Any driver exhibiting any signs of impairment (either drugs or alcohol) will not be permitted to race. No alcohol or drugs will be permitted at the track at any time during race event. 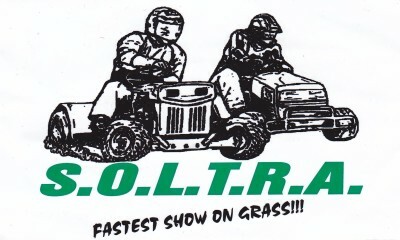 SOLTRA will not tolerate misconduct of any kind, on any website by members of SOLTRA which is disrespectful or detrimental to the sport of lawn tractor racing. If a member or members are disrespectful, as deemed by the SOLTRA Executive, that member or members will have his/her/their membership(s) revoked for the duration of one year. The reinstatement of the memberships of these individuals will be subject to Executive approval after this time. Any tubing used for bumpers or “Norbert Bars” must not be smaller than 1¼”, and must not be larger than 2” sq. or in diameter. All rear bumpers must be of one piece, solid design across the rear of tractor and not have any bends in the tubing. All engines, in all classes, must be a naturally aspirated, air-cooled, gasoline powered, vertical shaft engine of L-head or over-head design (with the exception of Stock Modified, where horizontal shaft engines will be permitted). All Engines must have an onboard starter (either pull type or electric) and are not to exceed 18 hp unless otherwise specified. All mufflers (if equipped) must not protrude excessively beyond any sheet metal (i.e. hoods, running boards). Super modified engines not to exceed 20 HP - 40 cu.in. for Intec. -38 cu.in for Vanguard. Any switches on tractors must not allow the engine to run without the tether cord attached. The organizers of any race event can and will remove anyone who is not complying with these rules. Anyone who exhibits reckless, careless, or dangerous driving will also be removed, at the discretion of the SOLTRA Executive. Any tractors using hydraulic brakes cannot use plastic hydraulic lines. Positive battery terminals on all tractors must be insulated/covered to prevent shorting on any metal surface. Red - all drivers must stop and shut down their tractors immediately and hold their position. Repairs are not allowed during red flag conditions. Yellow - all drivers must slow down and hold their position (no passing). Black - this flag is shown when a driver commits an infraction on the racetrack (rough driving, unnecessary bumping, etc.) A rolled flag, when shown to a driver, means that driver has one (1) lap to correct his/her performance on the track. If that driver does not correct his/her performance, he/she will be shown the full black flag, and must take his/her tractor to the pits immediately. d) Green - signals all drivers to GO! GO! GO! White - indicates one lap to go. Crossed yellow and green flags – race is at half way point. Checkered - the race has been won and is over. All drivers must pass by the checkered flag in order to be counted as completing the race. 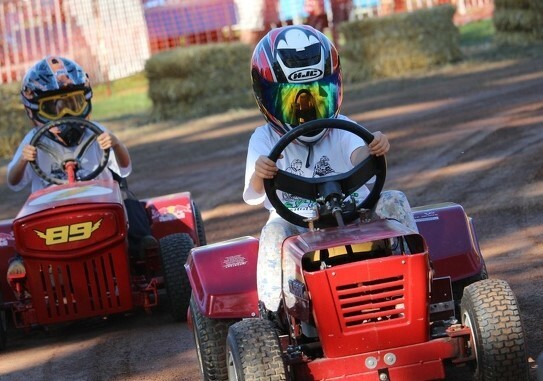 The driver(s) who are a lap (or more) down should stay to the inside of the track at all times, allowing the faster tractors to get around the track. Blocking by lapped tractors will not be tolerated. Any tractor that leaves the track during a race may draw a caution, at the discretion of the starter. If the caution waves, the offending tractor will go to the back of the field. Any driver needing to do repairs has 3 laps under caution to do so to hold their position, this applies to heat and feature race starts as well. On the original green flag, a driver is not permitted to pass until that driver has crossed the start/finish line. Failure to do this may result in that driver getting the black flag. In the event of a caution, re-start positions will be determined by the track officials. The driver causing the caution, and all others involved, will re-start at the rear of the field. 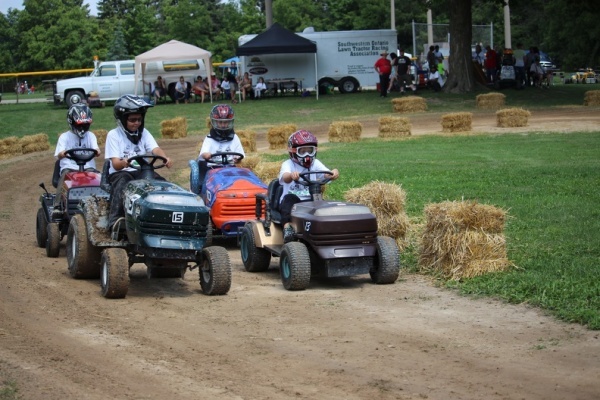 Passing on a re-start is not permitted until the lead tractor has crossed the start/finish line, and only then you are permitted to pass on the outside. "The Rookie Rule" - All rookie drivers, no matter what age or class, will not draw for position. These drivers will start at the rear of the field of their heat races in their respective classes with a yellow stripe across their shoulders and will continue to do so for 3 races or until deemed, by the Executive, ready to draw for their position. Also, all rookie drivers will have a yellow stripe taped across the rear of their tractor for one full season. In the event of a tractor break down, driver must remain on the tractor until yellow caution flag is shown, at which time the tractor must be removed from the track. Repairs must be made in the pits after which tractor may return to the track. (No repairs to be made in centre of racetrack.) Failure to follow this rule may result it disqualification and not being scored. If an engine is suspected to be illegal, an inspection of that engine may be done, including a tear down. If a tear down is required, it will be done by an unbiased third party with the owner/driver of the suspect tractor and at least one SOLTRA director present. If the suspect engine is found to be legal, it will be reassembled at the expense of the association. However, if the suspect engine is found to be illegal, it will be the responsibility of the owner/driver to reassemble that engine. A tear down will take place, if concerns are brought forward at no less than three consecutive races about the same tractor by no less than two different members. All technical complaints must be taken to the Executive for consideration after the completion of ALL racing. If a competitor complains about a winning tractor the, 1st, 2nd and 3rd place tractors will be inspected. All NEW super-modified drivers must be 16 years of age. No previous experience required. The Executives will be responsible for monitoring ALL new super-modified drivers, and will take all necessary actions required to ensure the safety of all drivers. If any driver is caught without having their safety equipment (e.g., tether cord, helmet, boots, etc…), attached or done up correctly, that driver will be suspended for that race. A second offense will result in suspension for one complete race day. A flag person has the authority to ask drivers to leave the track if they notice a safety issue (e.g., flat tire, loose or missing part). The driver will then leave the track. The flag person, with an Executive, will inform the driver of the infraction. The driver will be required to repair their machine before they will be allowed to return. All machines must start every race with all sheet metal (hood, fenders and grilles) intact. In the event a machine loses any of these parts during a race, that machine will be allowed to finish that race if deemed safe to do so by an official. DRIVE TRAIN: Must utilize a FWD/REV gearbox. (No multi-speed transmissions) Must use a centrifugal belt driven clutch. 3” centrifugal belt clutch to a 5 1/2” pulley on the bottom of transmission, 9 tooth gear on transmission output shaft to a 36 tooth gear on the rear axle. Straight axle allowed and recommended. BRAKES: Must be intact and working. Rotor and caliper type brake set up on rear axle is highly recommended. BODY: Can be custom fabricated to scale down build but must retain the appearance of a lawn tractor. FRAME: You may use a small 37”-38” wheel base frame, early MTD / HUFFY small riders used this type. Fabrication is allowed using the following dimensions: a rectangle measuring 42” x 13” outside using 1” X 2” rectangle tubing. The front axle if fabricated will have a centre of kingpin to centre of kingpin dimension of 16” – 17 ¾”. Axle is to be mounted at one end of the rectangle frame. WHEELBASE / WIDTH: Wheelbase is 37”- 38” centre line of front axle to centre line of rear axle. Width no wider than 36”. WHEELS / HUBS: Must use 6” rear rims with a 15” x 6” x 6” tire. Front wheels can be 5” or 6”rims. Turf tires only, can use steel or aluminum rims. BUMPERS / SIDEBARS: Bumpers can be made of 1” round tube, rear mandatory and no wider than the rear tires (double tube/loops mandatory). Front bumper optional, if equipped, must not exceed further than the front face of the tires, nor extend in front of the tread face, or must not be further than 2” from the leading edge of hood to leading edge of bumper. Sidebars are mandatory, to be mounted between front and rear tires enough to protect the driver feet and legs. Can be fabricated from round or square stock ¾” minimum. All bumpers and side bars to be at a standard height of 7” measured from the ground to the centre of bumper / sidebar. All tractors must have running boards. STEERING: Any improvements in steering is recommended. THROTTLE: Foot type, spring return throttle only. Tether kill switches mandatory and tether cords to be shortened to accommodate scaled down build. SPEED: 17 km/h. Subject to change by SOLTRA Officials. All tractors must have been a lawn tractor (no garden tractors) with a maximum rim size of 8” and a minimum of 6” front or rear, minimum tire size of 15” and maximum of 20” on rear. NO plastic wheels allowed. Blades, belts or mower decks must be removed so that accidental engagement of blades does not occur. Batteries and fuel tanks must be securely fastened to the inside of tractor chassis. If battery is mounted on outside of chassis, it must be fully enclosed and vented with a metal box. Bungee cords are not sufficient. Tractor may be as it originally came from the factory. No modifications, of any nature, are allowed to the engine (including governors and carburetor), or trans-axle, with the exception of the addition of running boards. All tractors must have running boards (foot pegs are not allowed). A “foot retainer” mounted on running boards from rear fender to front edge of running board, may be used. If installed you must use 1” round pipe (minimum height to be 3”, maximum height to be 6”). Engines will have a maximum of 3850 R.P.M. Tractors may be lowered by any means necessary to achieve minimum height of 4” from ground to bottom of chassis. Drive belts and pulleys may be changed to achieve maximum speed (40.0km/h) in high gear. If high gear allows for over-speed, a permanent gear lock must be installed to not allow tractor to exceed maximum allowable speed. Speed subject to change by SOLTRA Officials. Axle width with tires, front and rear, cannot exceed 42”. Wheels are to be held on to axles with center drilled axle with locking bolts, oversized cotter pins and washers, lock nuts or castellated nuts with cotter pins. Steering linkage may be discretely reinforced, or replaced with direct steering. Handelbars are not permitted. NO engine modifications will be allowed. All engines will be governed no higher than 3850 rpm. Front axle may be fabricated (may use “L“, “J” or “C” type spindles), but must be installed in original location, and must be of one-piece design. If “C” type spindles are used, kingpins must be a minimum 1/2” diameter, installed with a minimum 5/8” diameter spindle. Heim joints must be used in any steering component if a manufactured front axle is used. Front wheels must turn fully to the left and right. Foot-type, spring return throttles and tethered kill switches are mandatory. Rear bumpers are mandatory (fronts are optional). Bumper must be made of square or round tubing, no smaller than 1¼” and no bigger than 2” (outside dimension or square). All sharp corners/edges must be removed. Bumper must be made in a rectangular or oval configuration, and mounted so that the bottom, horizontal bar is aligned with center of rear axle and must be of one piece design [See “General Rule” #13]. Bumpers are not to be wider than overall width of axles (outside of tire to outside of tire) and cannot be recessed more than 1 ½” from outside edge of tires. Overall height to be no less than 4” and no more than 8”, measured center to center. Sidebars are highly recommended. Tractor body must be stock looking. All tractors may have a grab handle attached to left rear fender, but must have a hip bar mounted on right side of seat. The hip bar must be mounted at the driver’s belt line (waist height), when driver is seated on tractor. This device may be made of tubing (round or square) or flat bar, but is at the discretion of the tech committee. Seat springs/spacers may be removed to achieve lower center of gravity. Brakes must be intact and working (cannot drill cooling holes in brake disc). When applied, brakes must stop the rear axle. All trans-axles and transmissions must retain ALL gears and can be locked. Centrifugal clutches will not be allowed. Mufflers are optional. If removed, exhaust must be routed to the outside of tractor chassis, directed horizontally and covered with a suitable heat shield. Both front and rear axles can be widened to 42” (outside of tire to outside of tire) without offset. Transaxles can be locked for posi-traction. Front axle may be fabricated, but must be installed in original location, and must be of one-piece design. Kingpins must be a minimum 1/2” diameter, installed with a minimum grade-5. 5/8” diameter spindle. Heim joints must be used in any steering component. Front wheels must turn fully to the left and right. Rear axles may be of “live axle” design, but must go through a shift able gearbox. All trans-axles and transmissions must retain ALL gears. To enhance stability and safety of the tractor, it is suggested that both axles be at least 40” wide. Norbert bars/Nerf bars are mandatory. Must be constructed of round or square tubing and be minimum 1.25” and maximum 2” diameter. No open tubing ends are permitted. Open ends MUST be capped and all sharp corners removed. Width of bars is not to exceed the outside edge of tires/wheels can be no more than 1.5” in from the outside edge of tires/wheels. All Norbert bars to be of two bar design or have a secondary kart style hoop and must be able to resist side impact. Bars must be as long as possible between front and rear tires and be mounted at a height to protect the center line between front and rear axles. All tractors must have been a lawn tractor (no garden tractors). Rims can be no smaller than 6” and no larger than 8”. Tractors must have a minimum 15” tire on both rear wheels. Wheels are to be held on to axles with center-drilled axle with locking bolts, oversized cotter pins and washers, lock nuts or castellated nuts with cotter pins. Steel or aluminum go-cart type wheels will be allowed. NO plastic wheels. 2.Brakes must be intact and working (cannot drill cooling holes in brake disc). Any improvement in brakes in this class will make for safer racing. Only one brake assembly will be allowed, and when applied must stop the rear axle. Direct steering will be permitted. Handlebars are not permitted. Foot or hand controlled, spring return throttles and tethered kill switches are mandatory. If hand throttles are used, direct steering is mandatory!! Mower decks may be removed. If left intact, it must be solidly in place and must have a minimum ground clearance of 2.5” (from lowest point on deck to ground). Deck must not exceed overall width of tractor, a maximum of 42”. Mufflers are optional. If removed, exhaust must be routed to the outside of tractor chassis, directed horizontally and covered with a suitable heat shield. Batteries and fuel tanks must be securely fastened to tractor chassis. If battery is mounted on the outside of chassis, it must be fully enclosed, with a metal box and vented. Bungee cords are not sufficient. Drive pulleys and/or sprockets may be changed. Centrifugal clutches will not be allowed. Chassis cannot be widened, narrowed, lengthened or shortened by any means, with the exception of adjustable chassis pans, and then chassis must not be more or less than original manufacturer’s dimensional length. Discrete holes or slots may be cut into chassis to facilitate in the fabrication of the tractor. All tractors must have running boards (foot pegs are not allowed). All machines must have a tunnel, and it must have come from a stock lawn tractor. Tractors may be lowered by any means necessary to achieve minimum height of 4” from ground to bottom of chassis. All tractors must have turf tires only. Cutting of tires will not be allowed. All tractors may have a grab handle attached to left rear fender, but must have a hip bar mounted on right side of seat. It is suggested that the hip bar be mounted at the driver’s belt line (waist height), when driver is seated on tractor. This device may be made of tubing (round or square) or flat bar, but is at the discretion of the tech committee. recessed more than 1 ½” from outside edge of tires. Overall height to be no less than 4” and no more than 8”, me #13]. Bumpers are not to be wider than overall width of axles (outside of tire to outside of tire) and cannot be measured center to center. A device must be in place that will sufficiently protect the drivers back from other tractors (i.e. a “hoop” attached to the rear bumper). This will be left to the discretion of the tech inspector. This device should not exceed any higher than the middle of driver’s back when seated on tractor. Right angle gear boxes will be allowed in the modified division. Reverse gear is no longer mandatory. SAFER RACING!!!!) Only one brake assembly will be allowed, and when applied, must stop rear axle. Batteries and fuel tanks must be securely fastened to tractor chassis. If battery is mounted on the outside of chassis, it must be fully enclosed and vented with a metal box. Bungee cords are not sufficient. Cutting of tires will not be allowed. Rims can be of unequal size such as 8” on the outside & 6” on the inside. Rims can be no smaller than 6” and no larger than 8”. Wheels are to be held on to axles with center drilled axle with locking bolts, oversized cotter pins and washers, lock nuts, or castellated nuts with cotter pins. Front axles may be fabricated or reinforced, but must be mounted in the original location, and must be of one-piece design. Kingpins must be a minimum 5/8” diameter, installed with a minimum gr.5 5/8” diameter spindle. Heim joints must be used in any steering component. Front wheels must turn fully to the left and right. Axles, front and rear, may be widened (up to 42” outside of tire to outside of tire), and may have offset. Rear axle may be of trans-axle or live axle design, chain or belt driven. Consist of aluminum hubs, aluminum wheels, and hollow axle shaft. To enhance stability and safety of the tractor, it is suggested that both axles be at least 40” wide. Chassis cannot be widened, narrowed, lengthened or shortened by any means, with the exception of adjustable chassis pans, and then chassis must not be more or less than original manufacturer’s dimensional length. Tubular steel may be added for structural strength. Chassis may be altered only to allow installation of transaxle or live axle. Discrete holes or slots may be cut into chassis to facilitate the fabrication of the tractor. All tractors must have running boards (foot pegs are not allowed). All machines must have a tunnel, and it must have come from a stock lawn tractor. The use of centrifugal clutches will not be allowed. Chain drive systems will be allowed. All other pulleys/sprockets may be changed. All tractors may have a handle mounted on left rear fender, but must have a hip bar mounted on right side of seat. It is suggested that the hip bar be mounted at the driver’s belt line (waist height), when driver is seated on tractor. This device may be made of tubing (round or square) or flat bar, but is at the discretion of the tech committee. Rear bumpers are mandatory (fronts are optional). Bumper must be made of square or round tubing, no smaller than1 ¼” and no bigger than 2” (outside dimension or square). All sharp corners/edges must be removed. Bumper must be made in a rectangular or oval configuration, and mounted so that the bottom, horizontal bar is aligned with center of rear axle and must be of one piece design [See “General Rule” #13]. Bumpers are not to be wider than overall width of axles (outside of tire to outside of tire) and cannot be recessed more than 1 ½” from outside edge of tires. Overall height to be no less than 4” and no more than 8”, measured center to center. The use of direct steering may be used (and is strongly recommended). If handlebars are used, direct steering must be implemented, and must have come from a motorcycle, snowmobile, or an ATV. A certified aluminum (billet) flywheel may be used in any and all engines in super-modified only, but must be inspected by the tech committee for wear, corrosion and certification before installation, and must be set at the stock timing of 0 degrees. All other flywheels must remain in an unaltered, stock condition. When acquiring a new flywheel, it must be examined for wear, fatigue or corrosion. DO NOT USE IF THERE ARE ANY SIGNS OF WEAR, FATIGUE OR CORROSION. Scatter shields and magna fluxing of flywheels are highly recommended, but are optional. Super modified engines not to exceed 20 HP - 40 cu.in. for Intec. -38 cu.in for Vanguard.